For eight hours Camilia Nazerio hid in her bathroom with a 10-week-old baby, while one of the strongest hurricanes ever recorded bore down on them. Across two weeks of September Hurricane Irma, a category 5 hurricane, pummelled her way through the Eastern Caribbean. It was the second most powerful hurricane ever recorded in the Atlantic and had a devastating impact on many tiny island nations. 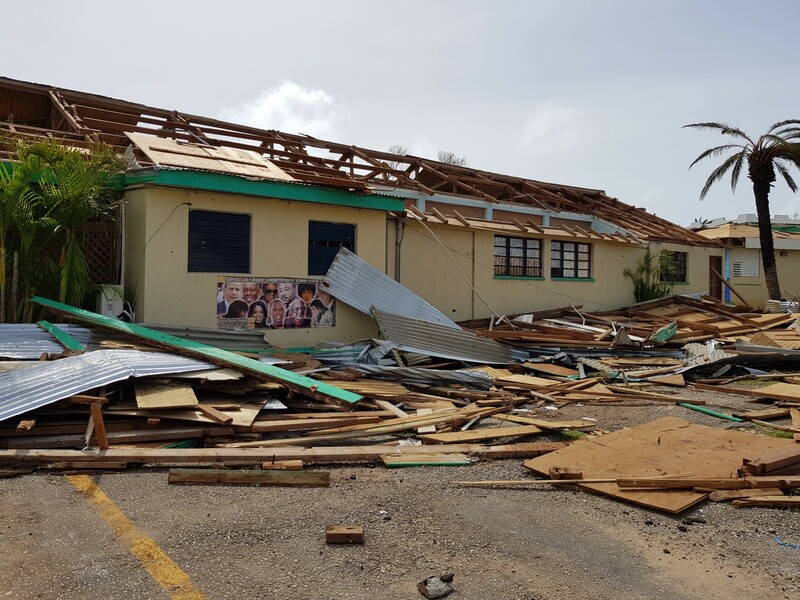 Anguilla, the British Virgin Islands, Barbuda, Turks and Caicos Islands were among the islands that were hit. When Irma made landfall in Haiti, Nachika Simon’s first thoughts were for her family. At just 12 years old, Nachika, is still a child herself, but she spent the following days looking after her baby niece while her sister focussed on the damage to her house. 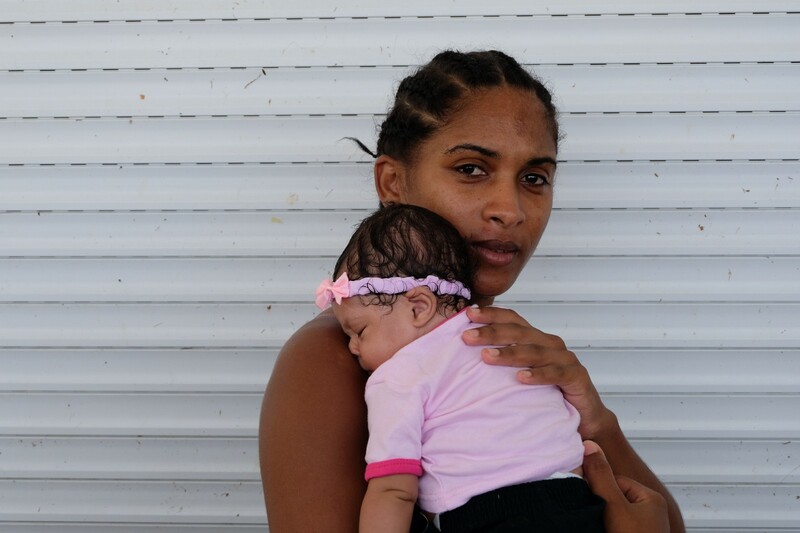 In Anguilla, Camilia Nazerio Pena spent the storm in the bathroom, which she had decided would be the safest room in her house for her and her baby. Once the storm had calmed down she emerged from the bathroom to find her roof severely damaged, the entire house waterlogged and all her belongings either damaged or destroyed. “I thank God that we’re all alive, but I feel like my old life is gone,” she says. 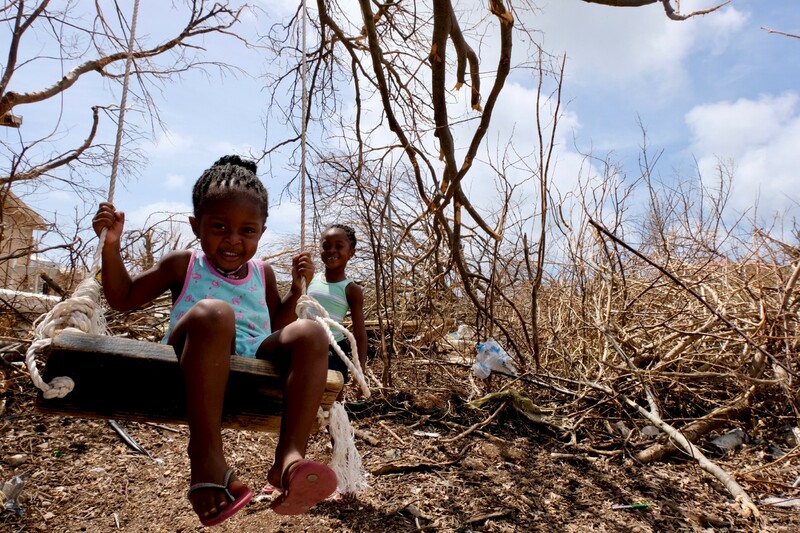 Across the Caribbean, schools and homes have been destroyed. Communities flooded. Livelihoods and possessions are gone. And many lives have been lost. So while the winds and rain have passed, the problems remain. 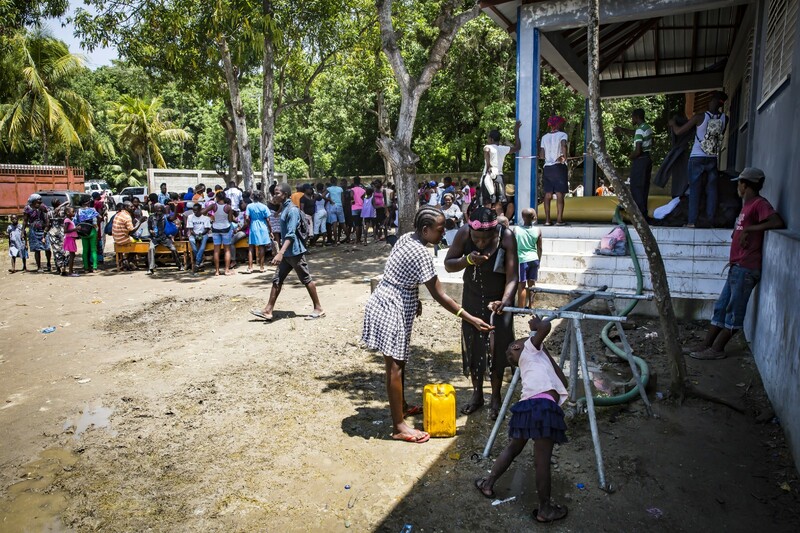 UNICEF’s chief concern is providing clean drinking water and sanitation to the affected communities. With schools and communities destroyed, child protection and the reestablishment of education systems is also a priority. 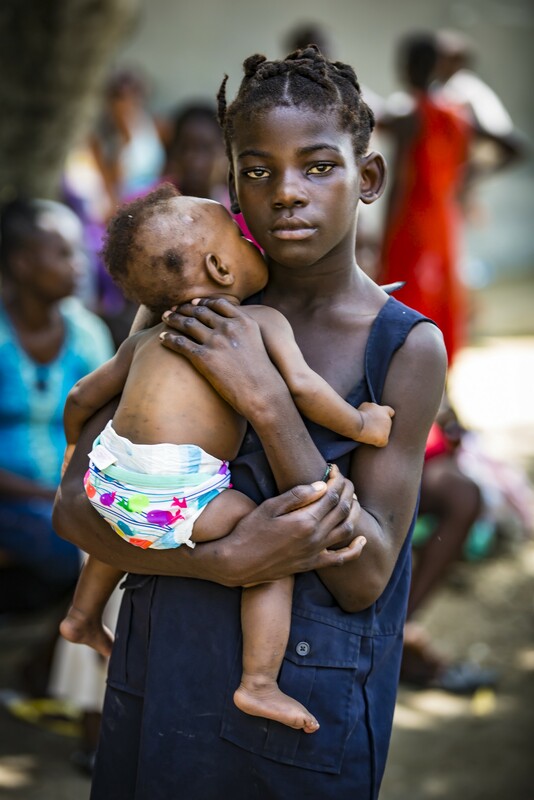 There are approximately 2.4 million children in need of urgent humanitarian assistance across the Caribbean. The island of Barbuda has had 90% of its infrastructure destroyed. The damage is estimated to include 137 schools which will be a significant strain on rebuild and recovery. The island is now derelict. And further pain is coming. The Caribbean and southern states of the USA have already dealt with Harvey, Jose, and Katia. Now Hurricane Maria, a category 4 storm, is bearing down on the region, having already cut off electricity to 100% of Puerto Rico, and destroyed 90% of the buildings in Dominica. With the Atlantic hurricane season just starting, further storms will continue to wreak havoc across islands that have already been pummelled. 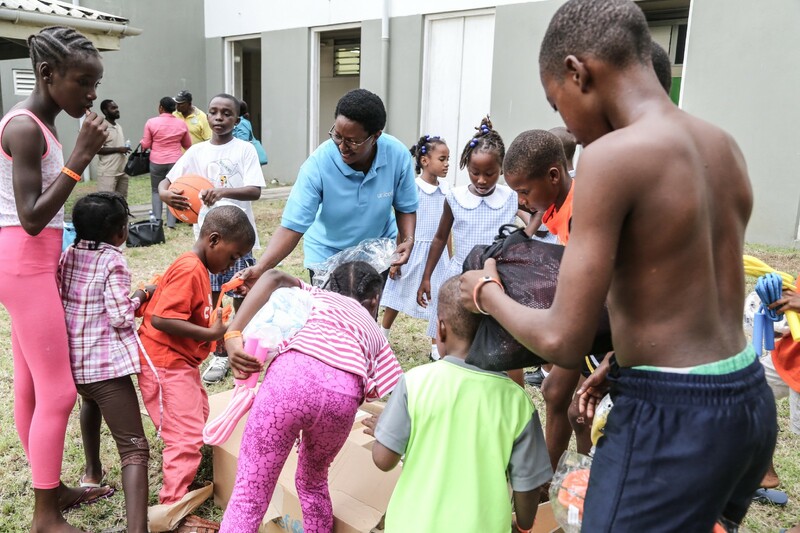 UNICEF distributes educational and recreational supplies, at St. John’s, Antigua. Because these kinds of disasters are unpredictable and fast moving, UNICEF is accelerating its efforts to help children cope with these traumatic events, the trauma of which lasts long after the event itself. Your generous donations help UNICEF to ensure that children gain access to support services and safe spaces to play, and socialise, and recover. It is the most natural thing in the world for a child to want to play, but it’s not easy when everything is gone. On Anguilla, two-year-old Tiquania, and five-year-old Tiquanisha were at home and awake with their family when the storm hit around 2 a.m.
Their parents, Tyrone and Krystal Lewis, had rebuilt their house with concrete after Hurricane Luis devastated Anguilla over 20 years ago. While the house survived, little outside it did. “The kids have seen everything turned upside down; somehow the swing was pretty much the only thing left standing,” said Krystal. When everything around them has been destroyed, a safe space away from the chaos can sometimes be the most important thing to a small child. With your support, we will be there for them, and ensure every child still has a place to smile, and be a child.